With the 2017 tax year behind us, tax professionals are laser focused on the various new rules presented by the recent Tax Cuts and Jobs Act (TCJA) effective for the 2018 tax year. 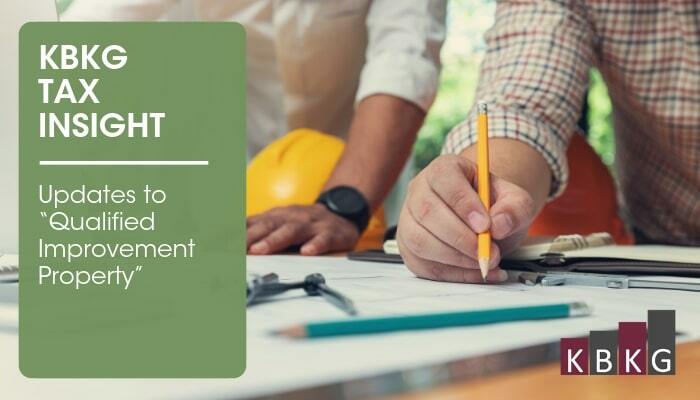 One of the most significant changes related to real estate improvements is the new eligibility criteria for qualified improvement property (QIP). The new law eliminates depreciation categories for qualified leasehold improvements (QLI), qualified restaurant property (QRP), and qualified retail improvement property (QRIP). Only qualified improvement property (QIP) remains. In this post, we will discuss updates for QIP and Qualified Improvements – Depreciation Quick Reference Chart (updated 03-02-18) that tax professionals can refer to during tax season. Prior to the TCJA, Qualified Improvement Property was eligible for 50% bonus depreciation. The published committee reports indicate that Congress’ intended to provide both a 15-year recovery period and 100% bonus depreciation for QIP placed in service after 2017. The drafters of the actual legislation tied bonus eligibility to property with a recovery period of 20 years or less. However, in their haste to push the law through they failed to also specify the intended 15-year recovery for QIP. The result is that, beginning with 2018, QIP retains its 39-year recovery period and loses bonus treatment altogether. Lowering the recovery period to 15 years would also have resulted in a 20-year Alternative Depreciation System (ADS) recovery period (versus a 40-year ADS recovery). KBKG Insight: Most tax professionals expected the release of technical corrections for multiple issues, including Qualified Improvement Property, before the end of 2018. However, the politics of passing corrections is complicated requiring bipartisan support from both Republicans and Democrats in Congress. There is speculation this could happen during the upcoming lame-duck session, but given the current political climate in Washington there is no certainty it will ever happen. The IRS must rely on the existing law as written and does not have the authority to correct these obvious drafting errors. Further, tax professionals should not assume technical corrections will occur before they need to prepare returns for the 2018 tax year. For now, QIP placed in service after 2017 is recovered over 39 years (40 years under ADS) with no bonus depreciation eligibility. The bonus depreciation rate was increased to 100 percent through 2022, after which it will decrease 20 percent each year. Notably, bonus depreciation is now available for used property acquired after September 27, 2017. To be eligible to claim the bonus, the taxpayer must not have owned or leased the property prior to the acquisition. Also, it must not have been acquired from a related party, a component member of a controlled group, or in in certain carryover transactions. Finally, bonus depreciation is not available to certain taxpayers with floor plan financing (e.g., used for motor vehicles, boats, and farm machinery). Therefore, many auto dealers will not benefit from bonus depreciation. Qualifying property eligible for 179 expensing now includes roof systems, HVAC systems, fire protection & alarm systems, and security systems, providing these improvements are made to non-residential real property and placed in service after the building was first placed in service. with furnishing lodging, such as furniture and appliances in hotels, apartment buildings, and student housing. After 2017, Qualified Improvement Property is eligible for 179 expensing. With so many changes to depreciation laws over the years, there is often confusion regarding the applicable placed in-service dates, recovery periods, and bonus eligibility of various real and personal property improvements. KBKG’s Qualified Improvements -Depreciation Quick Reference Chart (updated 03-02-18) consolidates these rules into a simple reference table that tax professionals can use to maximize deductions. Would like to see the chart.